It's not a surprise that smoking is a horrible habit to break, or that it is a viciously addictive habit. There are options out there, however, and there are many organic ways of quitting available. Not everyone knows what ingredients are in a cigarette. 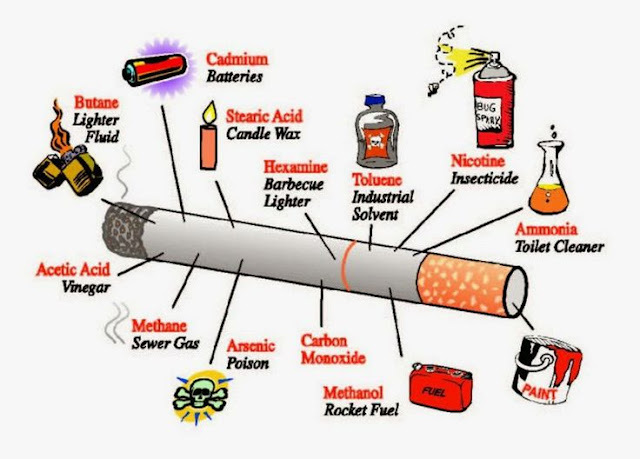 It is known that tobacco is the main ingredient but this isn't what causes the health problems. There are approximately 4,000 different toxins found in cigarettes, at least fifty of which are proven to be carcinogenic. It is mind boggling to that doctors used to consider cigarettes a healthy option, and was given to people to help them calm down and expand the lungs. This opinion died down, and despite proven scientific studies it is still legal. Nicotine is not only one of the most addictive substances known to man but also one of the most dangerous. IT is responsible for a majority of the withdrawal symptoms..
You might recognize the name as the stuff that your car emits through it's exhaust or the meters that should be in your house to prevent people from passing out and dying. A few of the other elements found in cigarettes include: arsenic which is the active ingredient for rat poison; hydrogen cyanide, used in WW II in the gas chambers, was outlawed by the Geneva Convention; DDT, an illegal, cancer causing insecticide; butane, also known as lighter fluid;sulphuric acid, powers car batteries and can eat through human skin; cadmium; maltitol, a sweetening agent not allowed in the US anymore. All in all not a healthy spread. What Happens To Your Body After You Smoke Your Last Cigarette? While smoking is terrible for you, the body recognizes the seriousness of the toxins. It starts working immediately and efficiently to remove all traces and damage. Within just 20 minutes of not smoking, your body begins a series of changes that continue for years. All you have to do is not smoke, for resources and support visit Smoke-Free.